‘House Democrats don’t want Gore humiliated’By Climate Depot Washington DC — UK’s Lord Christopher Monckton, a former science advisor to Prime Minister Margaret Thatcher, claimed House Democrats have refused to allow him to appear alongside former Vice President Al Gore at high profile global warming hearing on Friday April 24, 2009 at 10am in Washington. Monckton told Climate Depot that the Democrats rescinded his scheduled joint appearance at the House Energy and Commerce hearing on Friday. Monckton said he was informed that he would not be allowed to testify alongside Gore when his plane landed from England Thursday afternoon. “The House Democrats don’t want Gore humiliated, so they slammed the door of the Capitol in my face,” Monckton told Climate Depot in an exclusive interview. “They are cowards.” According to Monckton, Rep. Joe Barton (R-Texas), Ranking Member on the Energy & Commerce Committee, had invited him to go head to head with Gore and testify at the hearing on Capitol Hill Friday. But Monckton now says that when his airplane from London landed in the U.S. on Thursday, he was informed that the former Vice-President had “chickened out” and there would be no joint appearance. Gore is scheduled to testify on Friday to the Subcommittee on Energy and the Environment’s fourth day of hearings on the American Clean Energy and Security Act of 2009. The hearing will be held in 2123 Rayburn House Office Building. “The Democrats have a lot to learn about the right of free speech under the US Constitution. 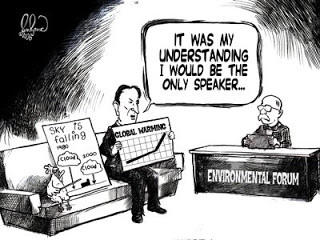 Congress Henry Waxman’s (D-CA) refusal to expose Al Gore’s sci-fi comedy-horror testimony to proper, independent scrutiny by the House minority reeks of naked fear,” Monckton said from the airport Thursday evening. A call to the Democratic office of the House Energy and Commerce Committee seeking comment was not immediately returned Thursday night. Poor Gore, he has to run and hide from all the scientists. What a joke he has become. I love CO2, too. I plant trees. Trees need CO2.